A collection of unidentified blobs was discovered toward the Coma cluster of galaxies, using the Dragonfly Telephoto Array. 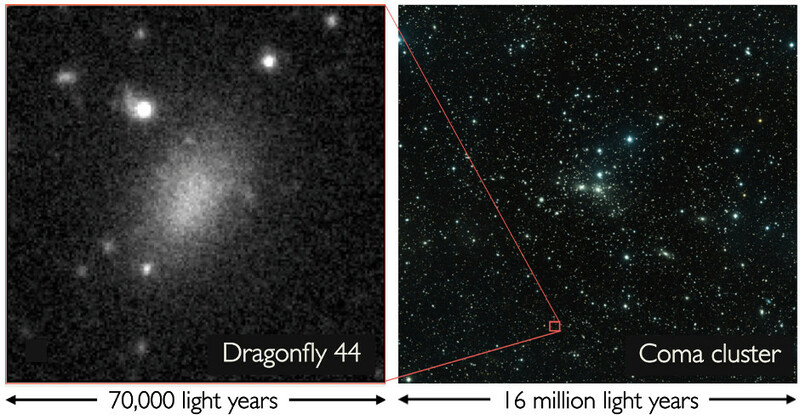 One of these puzzling objects, Dragonfly 44, was studied in detail using the Keck Observatory and confirmed as an ultra-diffuse galaxy. 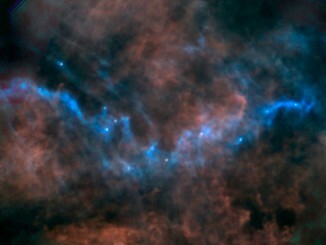 Even though it is 60,000 light-years across, It is so far away that it appears as only a faint smudge. Image credit: P. van Dokkum, R. Abraham, J. Brodie. An international team of researchers led by Pieter van Dokkum at Yale University have used the W. M. Keck Observatory to confirm the existence of the most diffuse class of galaxies known in the universe. 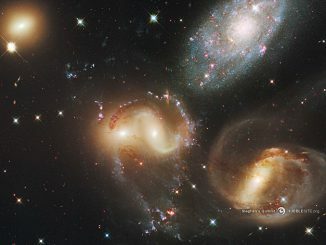 These “fluffiest galaxies” are nearly as wide as our own Milky Way galaxy — about 60,000 light-years — yet harbour only one percent as many stars. The findings were recently published in the Astrophysical Journal Letters. The team made the latest discovery by combining results from one of the world’s smallest telescopes as well as the largest telescope on Earth. The Dragonfly Telephoto Array used 14-centimetre state of the art telephoto lens cameras to produce digital images of the very faint, diffuse objects. Keck Observatory’s 10-metre Keck I telescope, with its Low Resolution Imaging Spectrograph, then separated the light of one of the objects into colours that diagnose its composition and distance. Reconstructed spectrum of light spread out from the ultra-diffuse galaxy, DragonFly44, as seen by the Keck/LRIS instrument. Dark bands occur where atoms and molecules absorb the galaxy’s starlight. These bands reveal the compositions and ages of the stars, and also the distance of the galaxy. Image credit: P. van Dokkum, A. Romanowsky, J. Brodie. Finding the distance was the clinching evidence. The data from Keck Observatory showed the diffuse “blobs” are very large and very far away, about 300 million light-years, rather than small and close by. The blobs can now safely be called Ultra Diffuse Galaxies (UDGs). The UDGs were found in an area of the sky called the Coma cluster, where thousands of galaxies have been drawn together in a mutual gravitational dance. “Our fluffy objects add to the great diversity of galaxies that were previously known, from giant ellipticals that outshine the Milky Way, to ultra compact dwarfs,” said University of California, Santa Cruz Professor Jean Brodie. 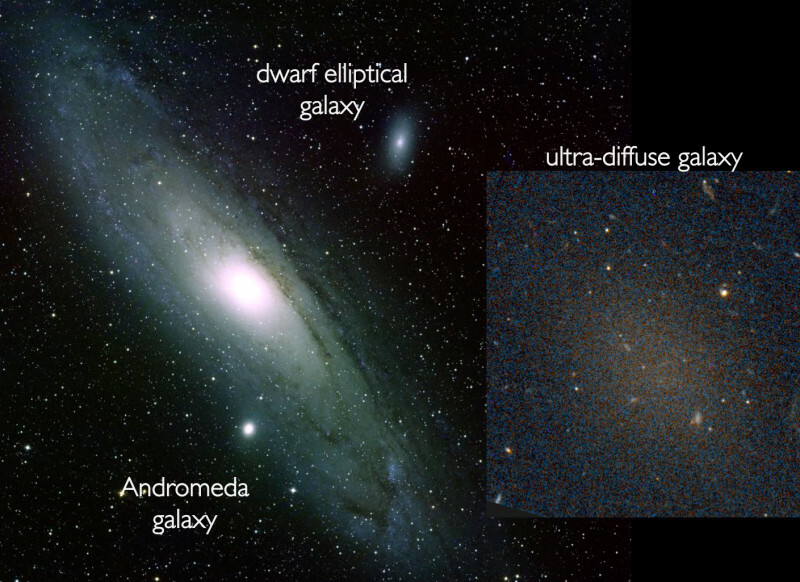 An ultra-diffuse galaxy, Dragonfly 17, is shown next to other types of galaxies, to scale. The Andromeda Galaxy is a giant spiral like our own Milky Way, and a dwarf elliptical galaxy, NGC 205, is also shown. Ultra-diffuse galaxies have the same number of stars as dwarf ellipticals, but spread out over a much larger region. Image credit: B. Schoening, V. Harvey/REU program/NOAO/AURA/NSF, P. van Dokkum/Hubble Space Telescope. 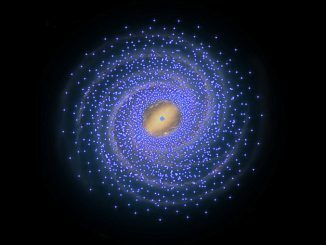 A major revision is required in our understanding of the Milky Way Galaxy according to an international team led by Professor Noriyuki Matsunaga of the University of Tokyo. The Japanese, South African and Italian astronomers found a huge region around the centre of our own galaxy which is devoid of young stars.